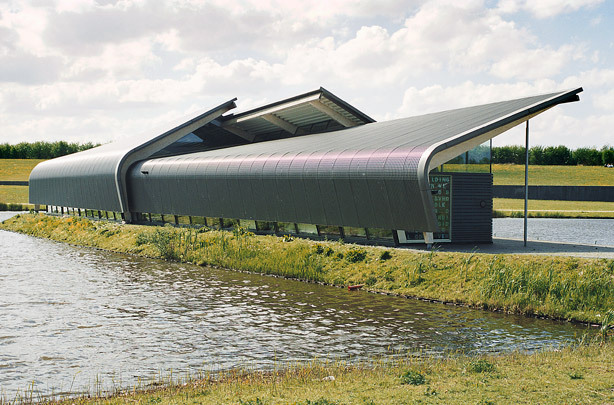 In 1995 De Verbeelding, the foundation responsible for the ‘Kunstbaan’ art route from the centre of Zeewolde into the polder, decided to have an art pavilion erected for activities and exhibitions. The modest programme is accommodated in an oblong volume constructed from laminated timber trusses set at varying angles, creating a remarkable basic shape outside and an exceptional space inside. Head elevations are of glass, whereas the sides are opaque so that artworks can be shown there. Daylight also enters through a strip of fenestration in the ridge of the roof and through strips along the underside of the entire building.